Aalayam - Colors, Cuisines and Cultures Inspired! : What's your Parenting Pet Peeve?? 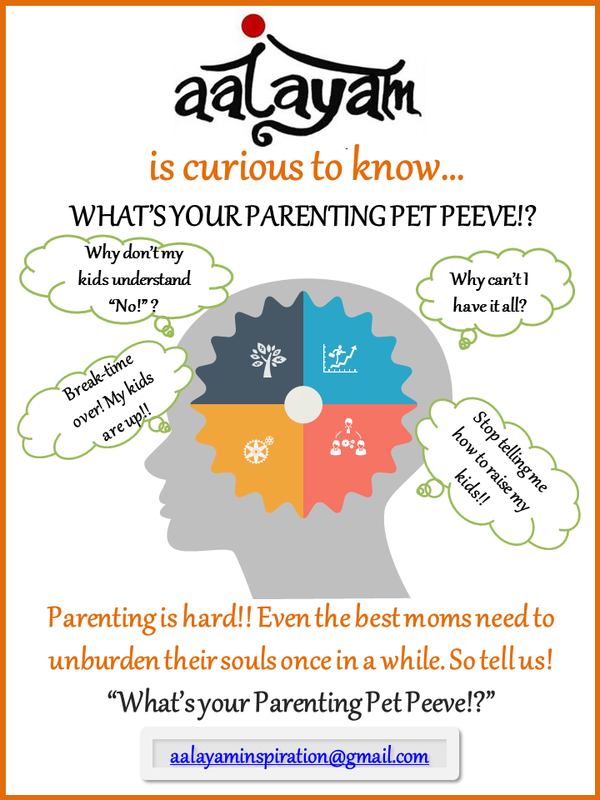 What's your Parenting Pet Peeve?? Hey guys, good to see you back! Parenting pet peeve, oh my goodness! :) Well, of the many, the one I harp about the most, is the fact that they don't seem to understand their bed time! 8:30 has come and gone, they are ready for bed, but in no mood to sleep. The bedtime story has been read, but they haven't yet settled down. It's past 9 pm now, and they are still awake. And as the minute hand marches along, I am so exhausted! :) and I am the one who has to wake up first and then have the sad job of waking up two sleepy heads on a school day! Truer words were never spoken Sharon!! Stay tuned for more Parenting pet peeves from around our circles.